Determining intraocular pressure (IOP), an important part of many specialty veterinary ocular examinations, can give examining clinicians vital information for diagnosing certain conditions. For example, lower than normal IOP is a cardinal sign of uveitis, whereas a higher than normal IOP is a main sign of glaucoma. Both conditions can result in permanent vision loss for the horse, and both can be difficult, time consuming, and expensive to treat. Thus, it behooves veterinarians to understand equine IOP to identify it early and treat any ocular abnormalities. While none of these clinical signs may be pathognomonic for any particular condition, tonometry can help the attending veterinarian determine the underlying cause. Many published studies pertain to equine IOP. There is general agreement that normal equine IOP is between 15 and 30 mm Hg. However, a number of factors may influence IOP readings, including time of day, head position, excitement, exercise, or sedation (sedative-related effects on IOP have been seen with xylazine, acepromazine, and ketamine). 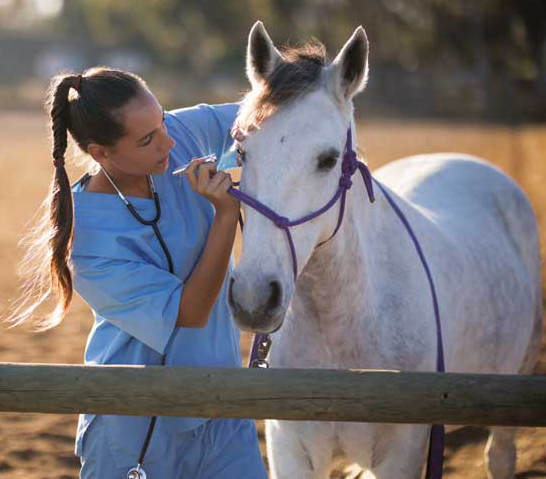 Local anesthesia is always required to accurately measure equine IOP. Topical anesthesia is a must. It has been suggested that an auriculopalpebral nerve block should be done prior to IOP measurements so as to decrease eyelid tension (which may falsely elevate IOP); however, studies on IOP with or without auriculopalpebral nerve blocks have had inconsistent findings. Head position has been shown to have a significant effect on equine IOP. It rises significantly when the horse’s head is below the level of his heart when compared with IOP measurements taken with the head at normal elevation. It is generally recommended that IOP should be taken with the horse’s head in normal position, and that care be taken to assure that the horse’s head is in the same position when repeated IOP measures are made. While diurnal variations in IOP have been confirmed in other species, no significant changes in IOP with time of day have been shown in horses. If significant corneal disease is present, the most normal part of the eye should be chosen for IOP measurements to avoid false readings. Measuring IOP in areas of fibrosis or corneal edema may result in falsely elevated IOP measurements. There are two ways to measure IOP: direct and indirect. Direct tonometry is the most accurate, but it is also invasive, therefore making it essentially useless for veterinary clinical applications. There are three different indirect methods to measure IOP. Rough assessments can be made using direct digital pressure on an anesthetized cornea. While, with sufficient clinical experience, it may be possible to roughly assess whether IOP is too low or too high based on a digital assessment—and particularly when the other eye is used for comparison—it does not give an accurate IOP measurement. Indentation tonometry is accurate; however, it requires specialized equipment (a Schiotz tonometer) and general anesthesia, making it impractical for use in an ambulatory setting. The third method, applanation tonometry, which measures IOP based on the amount of flattening that occurs in the cornea when a weight is placed on it, is practical and readily adaptable for field use (e.g., the Tono-pen). However, it has been reported that the Tono-pen slightly underestimates IOP in the horse. However, while practical and useful, applanation tonometry devices are expensive. Under all circumstances, it’s important to measure both eyes during IOP assessment. Measurements in the clinically normal eye serve as a good point of reference for IOP measurements of the clinically affected eye. Typically, the IOP of both eyes is within 3 to 5 mm Hg of each other. Changes in IOP occur due to imbalances between the production and rate of exit of the aqueous humor. IOP typically falls with inflammatory conditions such as uveitis, although early cases may still be within reference ranges. As uveitis resolves, IOP will return to normal. With chronicity, however, horses with uveitis also can have elevated IOP due to damage to the internal structures of the eye or synechiae. As a result, horses with chronic uveitis can go on to develop secondary glaucoma. The most common cause of elevated IOP is glaucoma. A horse is considered likely to have glaucoma when intraocular pressure is above 30 to 35 mm Hg. In glaucoma, changes to the exit rate occur due to obstruction of the outflow channels. If intraocular pressure changes persist, it impairs blood flow to the eye and causes the optic and neural structures of the eye to undergo degeneration. Interestingly, horses appear to be more resistant to elevated IOP changes than other species. It has been speculated that the equine eye is more resistance to IOP changes because horses are grazing animals that constantly raise and lower their heads, with concomitant lowering and raising of IOP, respectively. It is well known that equine eyes with glaucoma retain sight for longer than canine or human eyes with similar elevations in IOP. While it is certainly possible to provide good ophthalmological care of the equine eye without the ability to measure IOP, the information obtained from accurate tonometer readings can assist in early diagnosis and treatment for many conditions. Dr. David W. Ramey is a Southern California equine practitioner who specializes in the care and treatment of pleasure horses. Visit his website at doctorramey.com.